UPDATED: Sun., Oct. 8, 2017, 9:45 p.m. 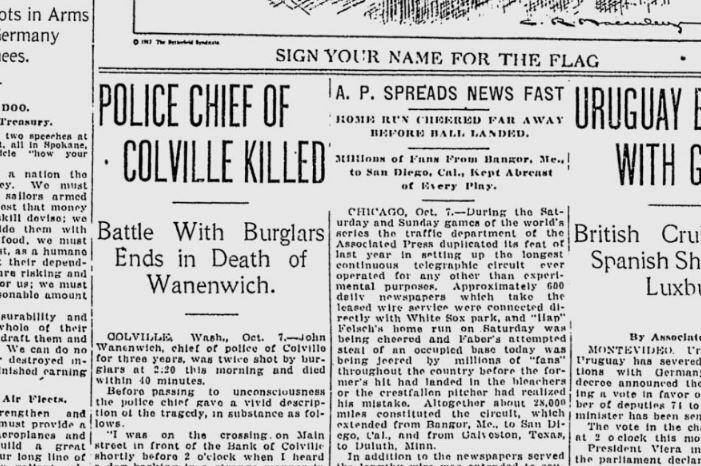 The Colville police chief, John Wanenwich, was shot and killed by two burglars during a nighttime gunbattle in a Colville alley. Wanenwich was hit by two bullets but lingered long enough to tell his story before he died. He said he heard a dog barking in a strange manner behind Barman’s Department Store. He walked to the rear door and realized something was wrong. Authorities were still hunting the two burglars. They discovered that they had rented a hotel room in Colville. The room was searched and police found a quantity of safe-cracking material, including nitroglycerine and paraffin wax. Police also believed that one of Wanewich’s bullets had found its mark, since blood was found on the sidewalk leading to the railroad tracks. “Every peace officer in the county was notified and posses were sent in pursuit.” The Spokane County sheriff and two deputies departed for Chewelah to assist in the pursuit. Wanenwich was described as “a model peace officer” who was popular in the town. Published: Oct. 8, 2017, midnight Updated: Oct. 8, 2017, 9:45 p.m.